I was in San Diego this past Memorial Day Weekend and had the great fortune to chat with a clean energy pioneer who is an evangelist for the power of Property Assessed Clean Energy (PACE) bonds to help fuel our transition to renewable energy and help promote energy efficiency. J.P. McNeill is the CEO of PowerHouse -- a San Diego-based company that was "founded to enable people of all income levels to make property investments in renewable energy systems, energy efficiency improvements, and water conservation measures." He explained to me that the PACE model offers real estate owners upfront financing for energy efficiency and renewable energy projects and that the owner pays back through property taxes over a 15-20 year period. But there has been resistance from mortgaging agencies such as Fannie and Freddie Mac, and they are waiting for clearer national guidelines from Washington. In my view this innovative financing system would do much to jump-start residential and commercial energy efficiency and renewable energy projects. 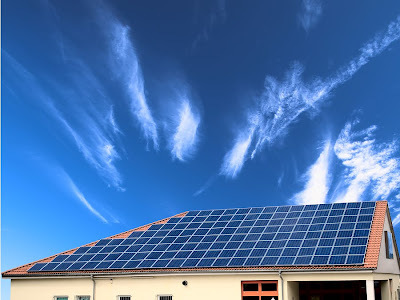 In the past some property owners have opposed implementing these types of projects because of the large upfront costs of installing for example solar panels on the roof, even though the money saved over time through lower energy bills more than makes up for the initial cost. PACE funding would instantly eliminate any of these perceived worries. While the PACE program is starting to roll out on the state and regional level, a massive nationwide push could start a solar panel revolution with PVs on every rooftop in America.